The Complete Precision Air Table helps investigate low-friction collisions. The recording system on this air table solves the problem of taking good quantitative measurements from an air table experiment. A spark generator delivers a spark that leaves a mark on the recording paper placed in the table. Students then use a protractor and centimeter scale to take measurements. The spark source can be operated at six different frequencies. Includes: air table made of heavy glass surface with metal frame, air compressor, aluminum support for air hoses, air supply hose, spark generator, two 550 g steel pucks, one 160 g auxiliary mass for unequal mass collisions, Velcro adhesive puck collars, two springs, four table pins, one orbital post with suction cup, two wire collars with hooks for pucks, a pulley, 100 sheets of recording paper, one sheet of carbon paper, and an instruction manual with suggested experiments. The recording system on this air table makes it easy to take good quantitative measurements from an air-table experiment. A spark from the spark generator leaves a mark on the recording paper placed in the table. Students then use a protractor and centimeter scale to take measurements. The spark source can be operated at six different frequencies. Storage recommendation for Carbon paper: Carbon papers should be stored in a dry place as the backing paper is sensitive to dampness. If not stored properly, the backing sheet will be difficult to remove from the carbon sheet. 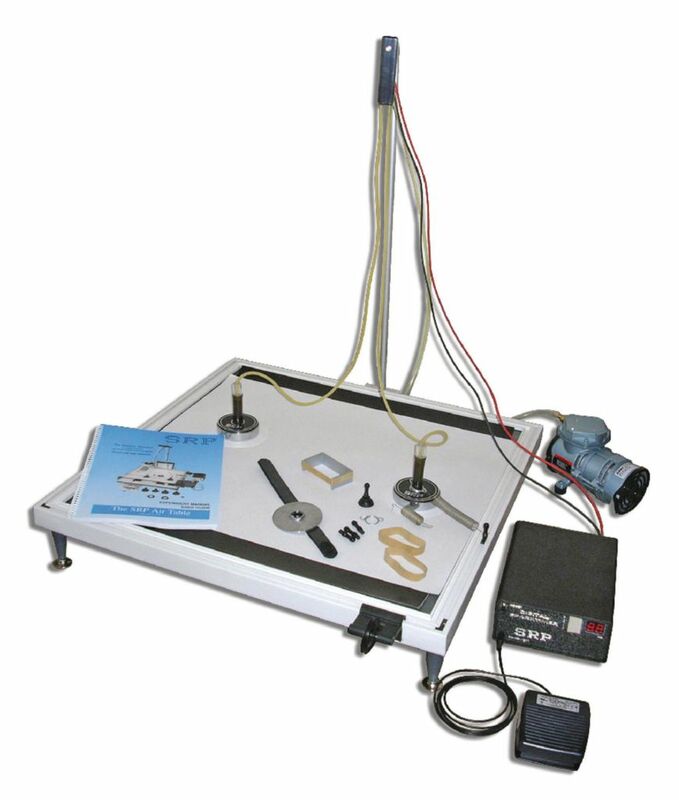 Ordering information: This kit includes an air table made of heavy glass with a metal frame, air compressor, aluminum support for air hoses, air-supply hose, spark generator, two 550 g steel pucks, one 160 g auxiliary mass for unequal mass collisions, Velcro adhesive puck collars, two springs, four table pins, one orbital post with suction cup, two wire collars with hooks for pucks, a pulley, 100 sheets of recording paper, one sheet of carbon paper, and an instruction manual with suggested experiments.